Businesses are local, global and often both. Oddly it’s got nothing to do with size. I know lots of people – musicians, artists, consultants – who are one-person global businesses. Other types of small businesses are definitely local. For example, if you’re a personal trainer, high street retailer, local solicitor, bar or restaurant then where you are probably matters a lot to your customers. If your customers care about where, making your website perform well locally is essential. Google made its name by indexing the world’s information. It’s now moved decisively towards indexing the world’s places. ; 20% of Google searches have a local component. A business website with strong PlaceRank will rank highly when a customer includes place in the search clue. For example, if you’re an aromatherapist working in Primrose Hill in London, it may not matter where you rank for “aromatherapy” globally. But if a customer searches on “aromatherapist Primrose Hill” you need to be top. 1. Register at Google Places and others location services. 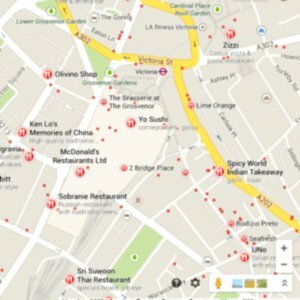 Google Places is free; it lets you register and verify the location of your business. To start, go to www.google.com/places. If you work at multiple locations, register all of them. Make the website keyword dense for local search – in our previous example, you optimise for “aromatherapist Primrose Hill”. Make sure your contact address details are searchable (i.e. make them HTML/text rather than graphics). Include a reference to your location in the excerpt text that shows up on a search results page. This works just like PageRank. Search robots crawl over the web looking for references to your business. The more local listings that point at your business, the higher you’ll rank. Take a look at www.getlisted.org for some prominent sites that Google uses for listings. Another tip is to check that your online information is consistent with offline business records like those with Companies House and HMRC. Don’t build your business on a .com domain unless you plan to be international or your business is in the USA. For example, if you work in Britain, choose a .co.uk domain which will rank slightly more highly on Google UK.